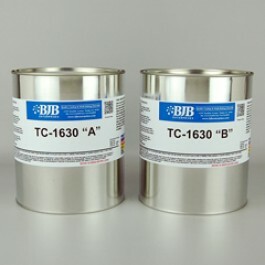 TC-1630 A/B Ultracast is best described as a "work-horse" material and is a staple product in countless shops around the globe. It's difficult to list all the ways it's used in the molding and casting world because users are always finding new applications for it. TC-1630 is a very hard, tough, fast setting filled polyurethane casting resin system which is ideal for: pattern duplication, vacuum forming tools, holding fixtures, foundry core boxes, wax casting, and general casting molds. It is unique because it exhibits very low shrinkage when cast in mass, yet still cures quickly for producing molds and parts in a production setting. It is also very heat resistant allowing it to be used in applications where ovens or extreme temperatures are used.